In Disney/Pixar’s vibrant tale of family, fun and adventure, aspiring young musician named Miguel (voice of newcomer Anthony Gonzalez) embarks on an extraordinary journey to the magical land of his ancestors. There, the charming trickster Hector (voice of Gael Garcia Bernal) becomes an unexpected friend who helps Miguel uncover the mysteries behind his family’s stories and traditions. Enjoy your own musical fantasy adventure with this interactive, light-up guitar inspired by PIXAR's <i>Coco</i>. Detailed just like the guitar Miguel discovers in the movie, this super fun toy plays chords with a simple press and a strum. You'll be singing the praises of this stylish <i>Coco</i> racerback tank top with every wear. Featuring papel picado-inspired screen art of Miguel, musical instruments, and more, this top will feel like a fashion fiesta! They'll always remember you for wearing this all cotton tee dedicated to Miguel from PIXAR's <i>Coco</i>. 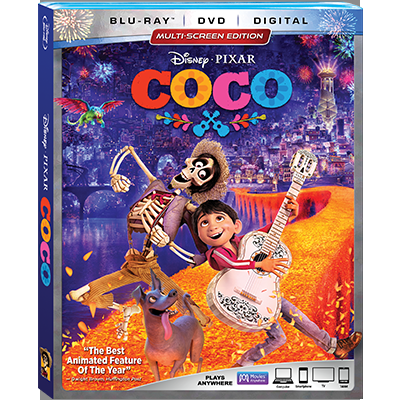 Add a dash of PIXAR's <i>Coco</i> to the kitchen table for something to sing about! These ceramic shakers add a burst of color to your kitchen and a burst of flavor to your favorite family dishes. Bring adventure to your kitchen with this handcrafted ceramic canister featuring <i>Coco</i> character art with a burst of color. Perfect for snacks at family gatherings and keeping Dante (and spirits!) out of the cookie jar! PIXAR's <i>Coco</i> is the celebration of a lifetime, where the discovery of a generations-old mystery leads to an extraordinary and surprising family reunion. Shine the included flashlight on the pages of this book to bring the art to life. This guitar necklace by Arribas Brothers will strike the right chord with fans of PIXAR's beloved <i>Coco</i>. Miguel's treasured instrument has been finely detailed in rhodium-plated brass and inlaid with colorful Swarovski crystals. This beautifully illustrated hardcover <i>Coco Big Golden Book</i> retells the whole exciting story of Miguel and his dreams of becoming an accomplished musician like his idol, Ernesto de la Cruz, and his visit to a mysterious and colorful land.